Khartoum - The new head of Sudan's military council said on Saturday a civilian government would be formed after consultations with the opposition and promised the transition period would last for a maximum of two years. Protesters, however, kept up the pressure for rapid change following the overthrow of long-ruling autocrat President Omar Al Bashir on Thursday. 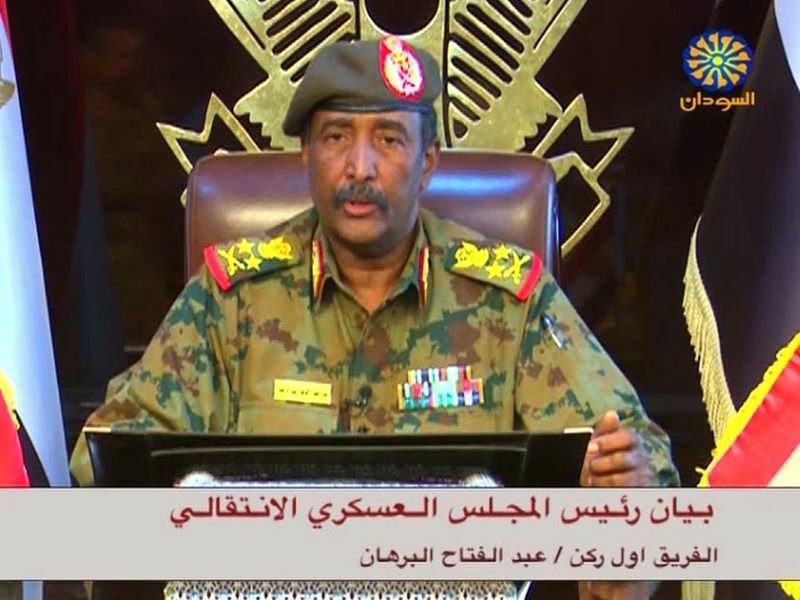 In his first televised address, Lieutenant General Abdel Fattah Al Burhan Abdelrahman cancelled a night curfew and ordered the release of all prisoners jailed under emergency laws put in place by Bashir before his downfall. During a meeting between the transitional military council and a coalition of opposition groups, including protest organisers, the protesters demanded that civilians be included in the council, opposition activists who were briefed about the meeting said. They will submit names of suggested members on Sunday. The military council also promised to "abolish all laws that restrict freedoms," the activists said. The main group organiser, the Sudanese Professionals Association (SPA), said in a statement that the council's response was not satisfactory and called for protests to continue. The SPA said that among its key demands the restructuring of the country's powerful National Intelligence and Security Service (NISS), the dissolution of militia forces that operated under Bashir and the arrest of all "corrupt leaders" involved in what it called crimes against citizens. "There are clear demands and unless they are met, there is no escape but to publicise full rejection (of the council's moves)," the SPA statement said, urging citizens to continue a sit-in outside the Defence Ministry. Thousands of people continued their sit-in outside the Defence Ministry in central Khartoum, a Reuters witness said. Bashir was overthrown on Thursday after months of mass protests brought on by rising food costs, high unemployment and increasing repression during his three decades in power. But activists and opposition groups pressed ahead with demands that Bashir's close associates leave. Regional powerhouse Saudi Arabia announced on Saturday it supported moves taken by the council and said it was sending an emergency aid package to Khartoum, state news agency SPA reported. "The Custodian of the Two Holy Mosques gave instructions to the concerned authorities in the Kingdom to provide a package of humanitarian aid, including petroleum products, wheat and medicines," SPA said. On Friday, Defence Minister Awad Ibn Auf, who was also Bashir's deputy, stepped down as head of the transitional military council after only a day in the post. On Saturday, state news agency and TV announced that the head of NISS, Salah Abdallah Mohamed Saleh, better known as Salah Gosh, had also resigned. He was once the most powerful person in the country after Bashir and protesters held him responsible for the killing of demonstrators demanding an end to military rule. A replacement has yet to be named. Celebrations erupted on the streets of Khartoum overnight after Ibn Auf's resignation. Thousands of protesters waved flags and illuminated mobile phones in the darkness and drivers hooted car horns. People chanted: "The second has fallen!" a reference to Ibn Auf and Bashir, witnesses said. "Islamists have now lost control and they are in shock. Their ability to project influence in an organized way inside the state appears weak," said Sudanese analyst Khalid al-Tijani. "The reason for the changes in Sudan is the pressure from protesters and pressures within the army, and the fear among military commanders of a split in the armed forces." LITTLE KNOWN Burhan, the new head of the military council, was the third most senior general in the Sudanese armed forces and is little known in public life. As head of Sudan's ground forces he oversaw Sudanese troops fighting in the Saudi-led Yemen war and has close ties to senior Gulf military officials. The head of Sudan's Rapid Support Forces (RSF), Mohamed Hamdan Dagalo, known by his nickname Hemeti, was appointed deputy head of the council, state TV reported. RSF soldiers outside the Defence Ministry fired their guns in the air in celebration of Dagalo's promotion, causing a brief alarm, witnesses said. "The opposition are demanding a civilian government, but I think it will be a mixed government," analyst Muhammad Osman said before Burhan's remarks on Saturday. "The military would want to retain the defence and interior portfolios." 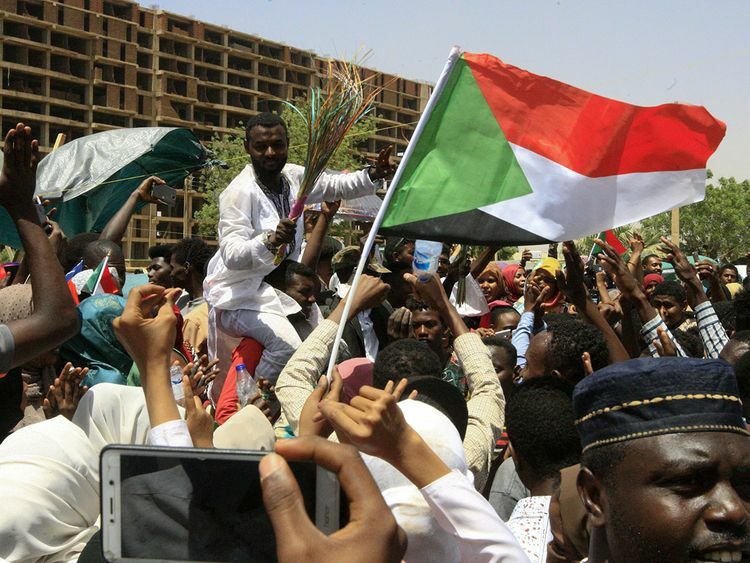 The Sudanese Professionals Association, which has been leading protests to demand a civilian government, called for more demonstrations earlier on Saturday. "We assert that our revolution is continuing and will not retreat or deviate from its path until we achieve ... our people's legitimate demands of handing over power to a civilian government," an SPA statement said. Bashir, 75, seized power in a 1989 military coup. The protests against him escalated last Saturday when thousands of demonstrators, apparently bolstered by change in Algeria following similar protests, marched towards the Defence Ministry to deliver a memorandum demanding the military side with them. Demonstrators have been camping outside the compound since then to push for a handover of power. At least 16 people were killed and 20 wounded by stray bullets at protests and sit-ins on Thursday and Friday, police said. Government buildings and private property were also attacked.